The government shutdown has just entered its third week, leaving 800,000 employees out of the office without pay until the government reopens. It turns out that the furloughed folks have turned to online dating! Zoosk’s user base of 40 million singles includes many DC-area daters. We decided to find out if there is any correlation between the government shutdown and dating…and it turns out that furloughed Washingtonians are flirting far more! More people looking to meet up: During the first and second week of the shutdown, the number of times DC-area Zoosk members have indicated a desire to meet up with another single through our Zoosk Carousel feature increased by 91.6% and 110%, respectively. More people are looking at profiles: During the second week of the shutdown, the number of profiles viewed by DC-area Zoosk members jumped by 45.6%. More instant messages are being sent: The second week of the shutdown showed a 48% increase in the number of instant messages sent between logged-in users in the DC area. More new active users are signing up: Zoosk saw new users in the DC area grow by 4.3% and 17.6% in the first and second week of the shutdown, respectively. 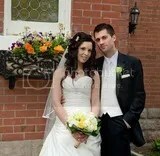 These users have all verified their accounts and uploaded at least one photo. In the wake of this frustrating situation, we’re glad that Zoosk’s mission of empowering people to lead a more fulfilling love life is bringing those out of work some happiness and, hopefully, some fantastic connections. Our exclusive survey with Glamour Magazine shows surprising results about commitment! Head over to Glamour for the full break-down of the results! 70.8% of men and 67.9% of women would actually kiss a frog if it meant they’d find true love. Well the good news is you don’t have to. Not when you can find your true love on Zoosk. We wish you love and luck in your search for a Valentine. ❤ Happy Zoosking! In celebration of International Flirting Week (February 13-19, 2013) and Valentine’s Day, Zoosk conducted a survey among more than 13,000 of our members around the world to gather their thoughts on flirting – why they do it, how they do it, and who does it best. So what did our survey discover? Well, here’s what we found out! Want to celebrate International Flirting Week? 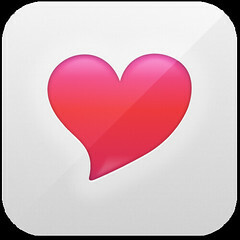 Flirt with someone today on Zoosk! Zoosk has 10 million fans on Facebook! Americans restrict social media sharing for the sake of their professional careers. 60% of Americans say they are cautious about posting romantic posts on social media because they are worried about what their co-workers might think. 64% of Americans would be more apt to share romantic relationship updates on social media if they were not Facebook friends with their co-workers. 38% of Americans say they just do not post any relationship or date night photos on social media sites for that reason. Couples embrace technology in their relationships. 81% of couples say they use technology to interact with each other throughout the day. 60% of couples say the primary role of social media in their relationship involves publicly expressing feelings of love or sharing photos/videos or relationship updates with family and friends. 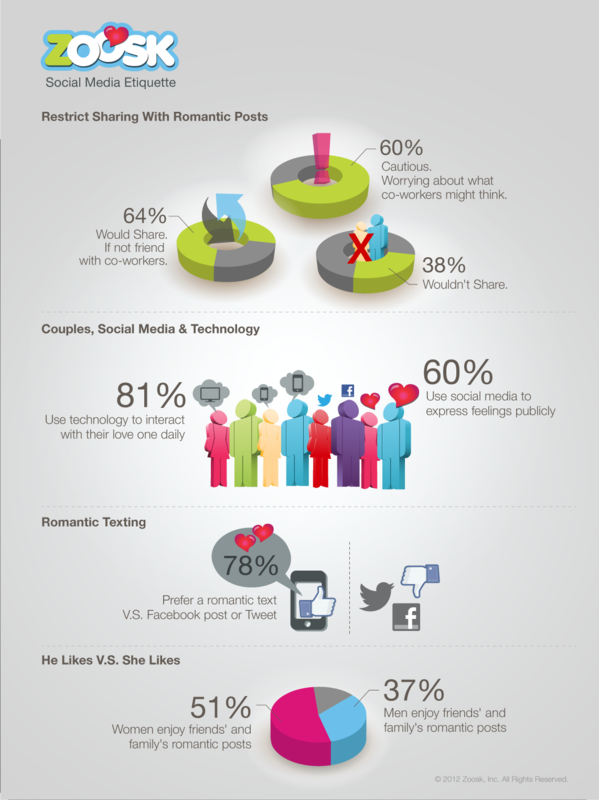 78% of Americans would prefer a romantic text vs. an affectionate Facebook post or Tweet. Women like to view their friends’ date night photos; men prefer privacy. 51% of women like to check out their friends’ romantic photos and updates. Only 37% of men like to check out their friends’ romantic photos and updates. Don’t go overboard on texting. Laurie Davis, founder of eFlirt Expert, says sometimes we mistake the convenience of communication for the availability of our sweetheart. Send no more than three back-to-back texts sans response. Use your professional filter. Julie Spira suggests if you wouldn’t say it in a job interview, don’t post it on Facebook. Stay on the same page. Everyone has a different level of comfort with online romance and it’s important to know your partner’s social sharing preferences. Have an open discussion about likes and dislikes, and don’t be offended if your partner doesn’t want to get digitally intimate, says Laurie Davis. Create group settings. It’s important to utilize privacy functions on sites like Facebook by creating groups that allow you to make sure that your coworkers are not opted-in to status updates about things you’d rather they not see, advises Laurie Davis. Zoosk’s couple profiles is also a private space for you to digitally capture the moments of your relationship, either keeping it just for the two of you or inviting close couple friends to join in your journey. About the surveys: Data shared in this release comes from three Zoosk surveys conducted online, among users of Zoosk who reside in the United States. A survey in June 2012 fielded responses from more than 1,600 of its members who are in a committed relationship. Surveys in July and August 2012 fielded responses from 3,146 and 1,281 members, respectively, who are single and/or in a committed relationship.